There’s a reason few people eat jackrabbits in this country: For many, they are indelibly stained as poverty food, a meat of the Depression or the even harsher privations of the pioneer farmers who eked out a living on the sod of the Great Plains. What’s more, non-hunters cannot buy jackrabbits, which unlike their cousins the true rabbits, will not cotton to domestication. And most hunters, who see these giant rabbits everywhere, rarely shoot them: Their minds are filled with cloudy notions about parasites, diseases and foul-tasting meat. This is a pity, because jackrabbits are nothing more than American hares. Not a true rabbit, most hares have dark meat whose color falls somewhere between duck and beef. Hares live longer and are smarter than rabbits, and give birth to young that can hop away at a moment’s notice; rabbit younglings are pink and helpless. Holly and I shoot hares, mostly black-tailed jackrabbits, whenever we get the chance. We do this for several reasons, mostly because they are gamey and delicious. Hares are more highly regarded in Europe, and I have many recipes for them from countries as disparate as Sweden and Sardinia. That’s where my most recent hare stew came from. I developed my recipe for a Sardinian hare stew from a rabbit dish called coniglio al guazzetto that I found in Giuliano Bugialli’s book Foods of Sicily & Sardinia and the Smaller Islands. 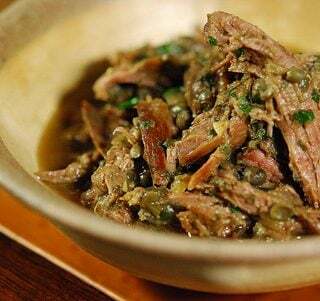 It is unusual in that it uses capers as a major flavoring component. The other dominant flavors are saffron, which grows on the island, and red wine vinegar. 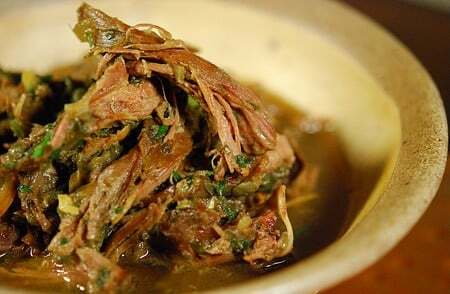 It is a heady dish, great for cold weather. 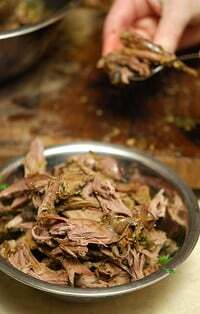 If you cannot get hare, which is likely I am sorry to say (although you can buy real Scottish hare from D’Artagnan), I would substitute lamb first; that just seems more Sardinian to me. 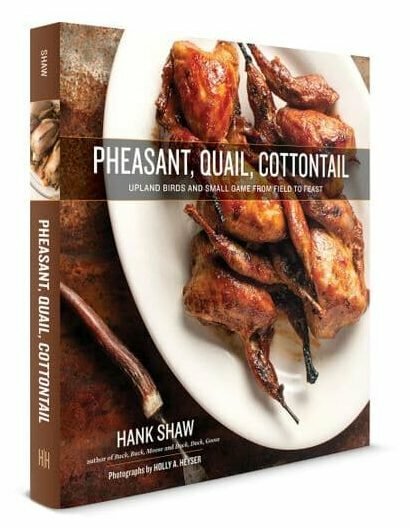 You could also go with rabbit or chicken, but make sure the chicken is as old as you can find — look for a stewing hen in Asian or Mexican markets. How did jackrabbits and hares get to be so stigmatized? Part of the reason is because those cloudy notions wafting through hunters’ heads have an element of truth to them. Jackrabbits, like all rabbits in this part of the world, can carry a disease call tularemia, which is no fun. You can tell by looking at the liver: If it is streaky with white marks, it may be infected. The meat will be fine, however, so long as you braise it well. Always wear gloves when butchering wild rabbits and hares in the West and you will be fine. There is another unusual thing about the meat of jackrabbits — it lacks a certain protein (or amino acid, I can’t remember) that most other meats do, so if you eat nothing but jackrabbits, as many Great Plains pioneers did, you will actually develop malnutrition; it’s a little like contracting pellagra from eating too much corn. Once our ancestors realized this fact, they banished jackrabbits from their diet. Tossing the bunny out with the bath water, I’d say. I would like to make the case for reintroducing hares to the American diet. For starters, jacks are abundant — and there is no closed season on them in many states. That means you can shoot as many as you will eat, whenever you feel like it. And they freeze well. You should know that jackrabbits in hot weather are not nearly so tasty as those in the fall (the ones I used for the Sardinian stew were shot in a pear orchard in September), and summer jacks can sometimes be attacked by botfly, which leaves icky sores on the hare’s back but does not normally affect the meat; botflies also affect other game animals, but the flies are usually gone by the time hunting season rolls around. Another reason to eat more jackrabbits and hares is because they are big. Really big. One black-tailed jackrabbit can feed four easily, and Holly and I got four meals out of two jackrabbit forelegs plus four hind legs. Still another pleasure of eating hares is their flavor. The dark meat is undeniably gamey, with an indescribable aroma and flavor that screams “wild.” It is not for everyone: One allegedly epicurean judge on Iron Chef turned her nose up at the wild hare she was served in “Battle Rabbit.” Keep in mind that snowshoe hares are very different — they are lighter in color and far milder, more like rabbit, actually. 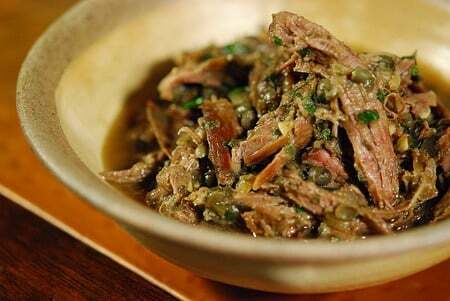 I like the lustiness of jackrabbit, however, especially with other strong flavors like the capers and saffron in the Sardinian stew. A little goes a long way. Which is probably the best reason why eating more jackrabbits and hares is a good idea in these tough economic times. Like I said, we got many meals out of a little more than one hare. The reason is because the meat is so flavorful you can plunk a dollop of stew on a bowl of polenta, or couscous, or rice, and be perfectly happy. We ate most of a loaf of bread when we first sat down to eat this stew. The only domestic animal I can think of that even comes close to the depth of flavor of a wild hare is an old chicken. Eating this way brought me back to my old days as a graduate student and cub reporter. I was poor, and needed to make meat stretch. I developed an eating technique that made sure I got some sauce and a little bit of meat with every large spoonful of grain. I always left the choicest piece of meat for the last bite. It was — and is — a gratifying way to eat. It felt like I was satisfying my Champagne tastes on a Budweiser budget. And that’s a good thing these days. I love the flavors of Sardinia: saffron, capers, lusty sauces, stews and game meats. This stew has it all. The recipe has its origins with a rabbit recipe I found in Giuliano Bugialli’s Foods of Sicily and Sardinia. It is traditionally done with rabbit or chicken, but I had some jackrabbits — really hares – I wanted to cook, so here it is. The dominant flavors here are the gamey hare, vinegar, saffron and capers. Use the best saffron you can afford here; it matters. It is a heady mix that needs a strong red wine, crusty bread, couscous or our favorite, a soft polenta with butter and cheese. Salt the hare or rabbit pieces well and set aside at room temperature for 30 minutes. Get the olive oil hot over medium-high heat in a large pot or Dutch oven. Pat the hare pieces dry and brown well in the pot. You might need to turn the heat down to medium. Do it in batches and take your time. Place the browned pieces in a bowl while you do the others. This could take 30 minutes. Meanwhile, chop half the capers. Get your tap water running as hot as it will go and fill a cup measure. Crush the saffron in your palm and sprinkle it into the hot water. Get every bit, and let this soak as the hare is browning. Once the meat is all browned, remove it to a bowl. Add the onion and saute until browned. Add the garlic and cook for 1-2 minutes. Add everything into the pot except the extra 1/4 cup parsley, nestling the hare pieces in tight. If the liquid does not come at least halfway up the sides of the hare pieces, add some more water. Do not add wine or stock — the point is to have pure flavors here. Cover tightly and simmer gently over low heat for at least 90 minutes. Hare needs longer, but chicken and domestic rabbit should be done by then. Check the hare after 2 1/2 hours; it should be close to falling off the bone. When it is, pull the meat out and strip it from the bone. Return it to the pot with the extra parsley and mix well. Turn off the heat and cover for five minutes. Serve over polenta, couscous, Sardinian fregula pasta or with crusty bread. Don’t forget the wine: You will want a big, heavy red here.